2. The meeting including the seminar was attended by some 131 participants coming from 86 institutions. The Seminar which was held earlier on November 2nd was officially opened by Mr. David Nendick, Hongkong’s Secretary for Monetary Affairs. He stressed the role of private sector initiative in the emergence of Hongkong as an international financial centre in the Asia Pacific region and the commitment of Hongkong to the free market philosophy. He later turned to events in the past two weeks and the rationale of the steps taken to cope with the stock market crash. 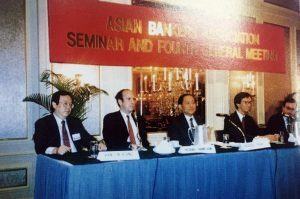 On the consequential and very serious impact on the physical stock market if trading was not suspended and the necessary support arrangements put in place, he said that the damage to Hongkong reputation as an international financial center would have been im­measurable. He concluded by wishing the seminar a success saying seminars of this type provide valuable opportunities for the sharing of experiences and stimulation of new ideas. 3. 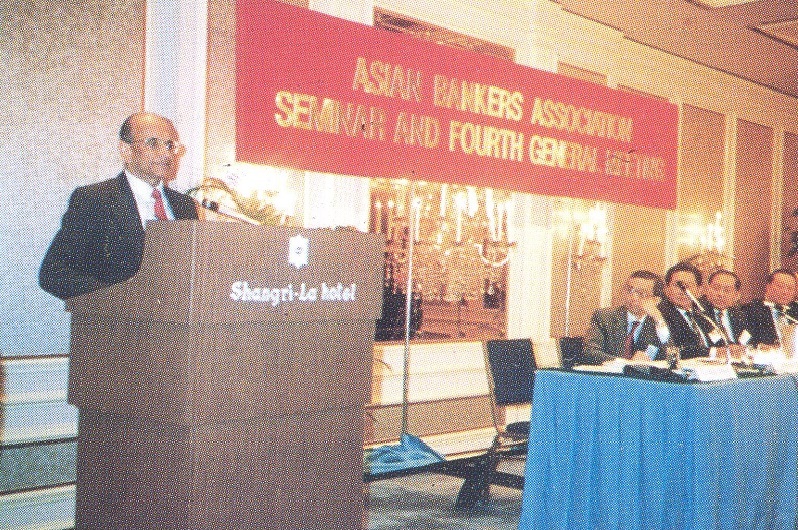 Dr. Amnuay Viravan, Chairman of ABA, presided over both the seminar and the meeting. Mr. Patrick Yeoh, Vice Chairman, presided over the afternoon session. In introducing the theme of the seminar, Dr. Viravan explained the reason for the choice of “Investment Banking” as a theme for the year’s ABA seminar on its expanding role and growing importance in the global financial market. The scope of investment banking has become more sophisticated, more challenging and rewarding. It has indeed become the darling of the financial world, he said. He added that this trend has been brought about mainly by the liberalization of capital fund flow in the global market. It has given much greater prominence to the capital and security market, so much so that many leading international banks have restructured their organizations to take advantage of this development. He expressed appreciation to the speakers for giving ABA and the participants their expertise and valuable time to address the seminar. 4. Mr. Hideaki Shiozaki, Managing Director of Nomura Securities Ltd. focused his presentation on the ongoing globalization of the international capital market, and on the recent evolution of the Tokyo capital market within the context of globalization. He said that globalization would be impossible without recent remarkable advances in telecom­munications technology. Today, all we have to do is press a few keys on our desktop keyboards and we have real-time access to a great variety of information from overseas. We can get the latest financial results of U.S. companies, European economic statistics, or even bid- offer prices from all over the world. Money seems fairly timid, by its very nature. It is rarely going to move freely on its own without the stimulus provided by such information, he stressed. “Financial high-tech” is another vital feature of globalization. By this term, I mean the ongoing revolution in methods of raising and using capital, such as by setting up financial subsidiaries, or by developing international tax shelters. Here again, investment bankers are helping to break down conventional barriers between different capital markets around the world, he added. Twenty-four-hour trading is now an everyday practice in the market for Eurobonds, and in the markets for other types of bonds as well. Equities have also entered the age of twenty-four-hour trading, he pointed out. 6. Mr. Antony K. Leung, North Asia Investment head of Citicorp/Citibank, NA, Hongkong, discussed effective organizational structure. He first tried to define the scope of investment banking, the products covered, the activities it involved, and the trend towards its expansion. He then presented various organizational set-up based on products or activity emphasized or focused on, giving the considerations to be made in terms of customers, geography, whether centralized or not, the scope and the generalists or specialists available. He also discussed the resultant structure after considering various factors but concluded that there is really no ideal structure in a combination of products carried or activities undertaken. He pointed to the management challenges that one encounters in the industry. He also provided the standards for measuring or evaluating performance and described what an effective organization should be able to do. 7. 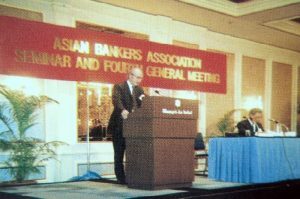 Mr. Timothy Brennen, Executive Director of Merrill Lynch Capital Markets, Hongkong, dwelt on investment banking products and on the future of investment banking business in general but specifically for investment and commercial bankers in Asia. He focused on several key areas such as product development over the past decade, current profitability and prospects for cer­tain products, strategic issues in the current environment, relevance of international products for Asian markets and the relationship between investment and commercial banks. 8. Dr. Wan-ling Kiang, President of China Development Corporation, Taipei, talked on Investment Banking from the view of a regional development finance institute. In Asia which is experiencing strong economic development, there is the need for a concurrent development in local capital markets, he emphasized. Rapidly integrating global financial markets have impacts on the region and prior experiences in industrial countries indicated that investment banks are impor­tant agents in capital market developments, he explained. He then examined the various relevant issues in such development. Citing from the experience in Taiwan, he cited that while the economy has seen a long record of continuing economic growth, it has an underdeveloped capital markets with corporate developments largely supported through bank financing. He pointed out, however, that economic liberalization is now a stated government policy and there is a trend towards financial liberalization. He said that even though Taiwan has had a consistent high savings rate, availability of credit was always in short supply until a few years ago. 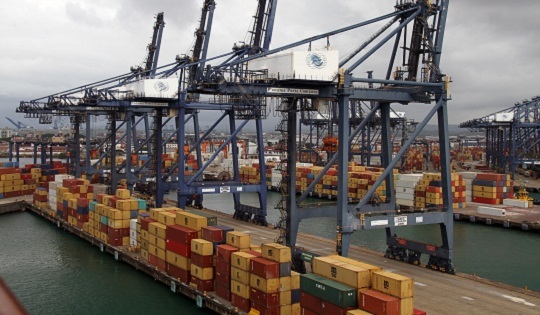 Compounded by trade surplus and excess liquidity in the economy, supply of credit swelled. Finally in July 1987, foreign exchange control was substantially deregulated. Such major change will quickly Induce other changes in the financial system. He suggested seven policy alternatives for ROC’s financial development. 9. 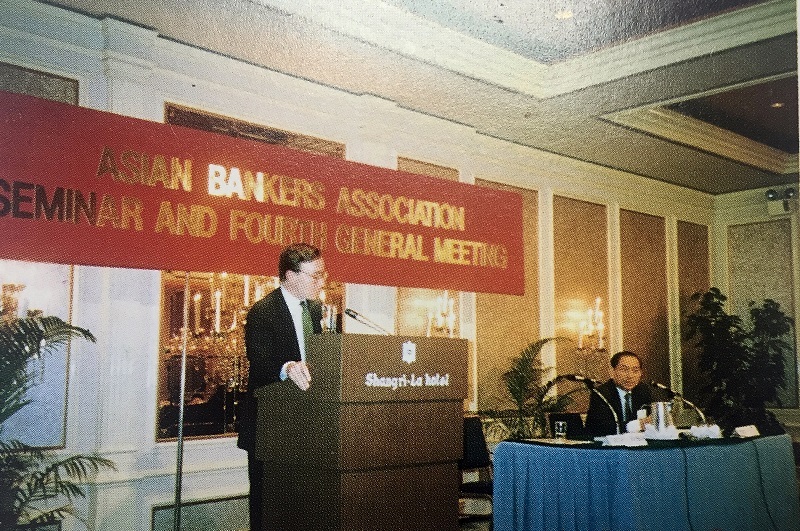 Mr. David K. P. Li, Director and Chief Executive of The Bank of East Asia Limited and Chairman of the Chinese Banks Association in Hong Kong, addressed the participants at luncheon. He discussed about the challenge of foreign institutions and the response of Chinese banks on investment banking in Hong Kong. In summary, he said, the past decade has seen an influx into Hong Kong of foreign financial institutions which have helped to reshape the local investment banking scene. In response to the challenges posed by new competitors, Chinese banks, traditionally a major force in Hong Kong’s financial sector, have also moved into investment banking. “Although I foresee more and more Chinese banks becoming involved in investment banking in the future, I expect most Chinese banks will still maintain and develop their retail banking business, which is where their competitive edge lies. The future pace of advancement in investment banking by Chinese banks depends largely on the growth of Hong Kong’s capital markets, the prospects for which are very promising,” he said. 10. After each speaker has made his presentation, an open forum was held. 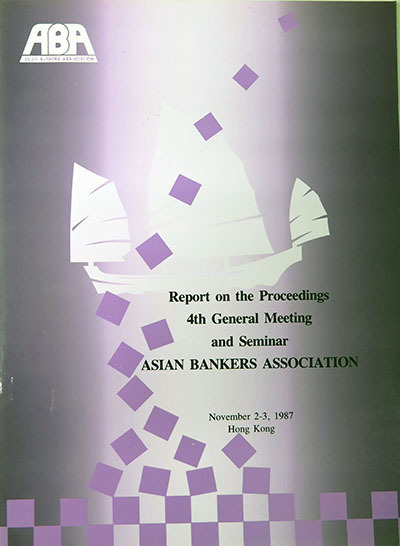 The full text of all the speeches and presentations including country reports on the theme as were available in writ­ing are published in the ABA Journal of Banking and Finance, third issue (1988). 11. 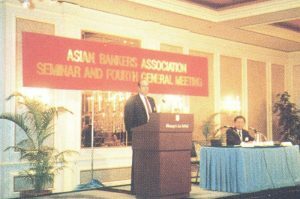 The 4th General Meeting held on November 4th was opened with the report of the Chairman, Dr. Viravan, on the activities of ABA since its last general meeting held in November 1986. He specifically cited the efforts by the Board in amending and updating the Charter and the con­solidation and expansion of membership. He pointed to the 4th General Meeting as the first attempt at holding meetings and seminars in the light of previous precedents of having regular meetings every two years. 13. He then called on Mr. Jeffrey L. S. Koo, Chairman of the Special Committee to review the Charter, to present the highlights of the proposed amendments. The text of Mr. Koo’s presenta­tion is attached as Annex A. After Mr. Koo’s presentation, a motion was presented and duly seconded, to adopt all the proposed amendments. It was unanimously approved. The full text of the proposed amend­ments by substitution as approved is attached herein as Annex B. 14. Prior to the General Meeting and Seminar, the Board of Directors met on November 1. The minutes of the Board Meeting is attached as Annex C.
15. The members agreed to have their next General Meeting on October 31st to November 1st, 1988 in Singapore. 16.On motion of Mr. Stuart Fowler, duly seconded, the meeting ended with a vote of thanks to the Chairman, the Vice Chairman, Mr. Koo and all the speakers for their able management of the seminar and meeting and for their respective presentations. 17. In closing the meeting, Dr. Viravan speaking on behalf of the Board thanked all the members and participants present and expressed the hope that the officers can again count their sup­port and attendance in Singapore. He said the Association is theirs. It is committed, he added, to regional cooperation and that he would like to seek their suggestions and advices in this regard and in improving its services to members. The meeting was adjourned at 11:20 a.m. and a farewell lunch followed.